The engineers of Tetra Tech Geomatics Group have a long association with SporTVision, the pioneer video graphics company best known for inventing the “yellow line” now standard in television broadcasting of football games. Ten years ago, when SporTVision began supporting the television broadcast of NASCAR and other automobile racing they asked the Tetra Tech photogrammetrists to support their work by developing high accuracy digital models of race tracks around the country. 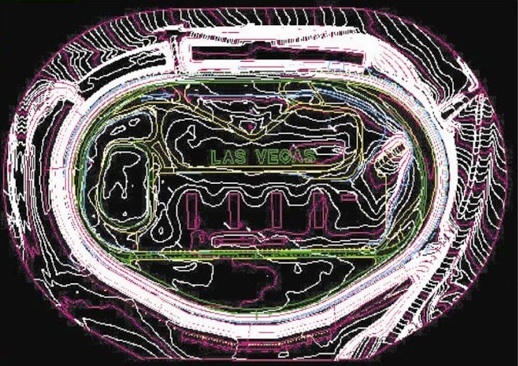 To date approximately 40 tracks have been mapped under the program including recent revisions of Daytona International Speedway and Phoenix International Raceway. The approach uses aerial photography collected at low altitude and controlled for mapping by surveyed ground points and Airborne GPS collection. The mapping conforms to 20-scale accuracy standards and is delivered to SporTVision in a format customized for their system.